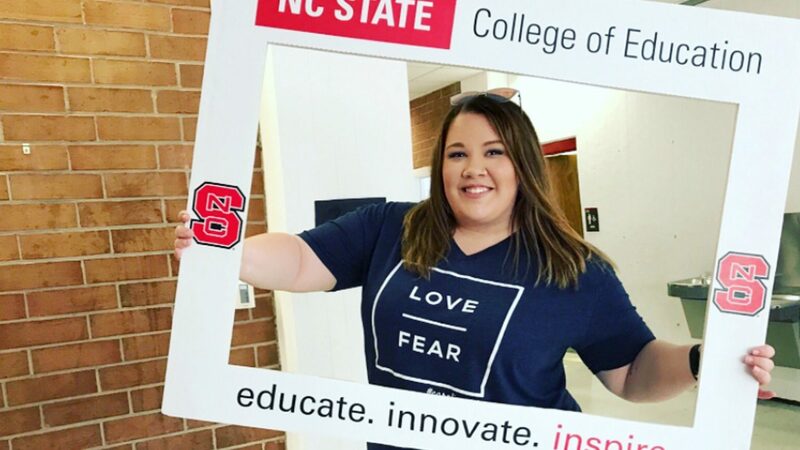 Alicia Hatmaker, a second-year social studies teacher at Athens Drive Magnet High School in Raleigh, was one of the nearly 185 teachers from across North Carolina who attended the fifth annual Beginning Teacher Institute. About 185 teachers from 40 counties in North Carolina attended the NC State College of Education’s fifth Beginning Teacher Institute July 11-13. The teachers — all in their first, second or third years of their teaching careers — participated in sessions and workshops designed to provide practical tips and strategies to help them be the teachers they want to be. Twelve of the beginning teachers shared with ced.ncsu.edu at least one thing they learned during the institute they will use in their classroom. Home and still talking about #NCSUBTI! And when I get to work tom, I will be talking about it again! Such an amazing experience! Teachers attending the Beginning Teacher Institute also took to Twitter to share what they learned during the sessions and workshops. Here’s a snapshot of what they said.